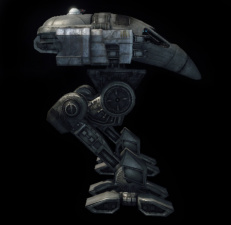 The Raven is an Inner Sphere Light Mech primarily used for scouting. It has a very distinctive profile, looking like a large bird beak on two chicken-like legs. Well-Armored for an Inner Sphere light mech, it can be difficult to kill. In most cases, the Raven sacrifices weapons and speed for a wealth of equipment, such as Laser Anti-Missile Systems, Active Radar Probes, Myomer Accelerator Signal Circuitry, Guardian Electronic Countermeasures, and Enhanced Optics. Some variants are also equipped with Target Acquisition Gear or NARC beacon launchers, allowing them to direct friendly missile fire. All variants are equipped with Command/Control/Communications (C3), allowing them to share target information with allied vehicles in range. Due to this vast array of target-marking and electronic warfare equipment found in nearly every variant of it, the Raven makes an excellent scouting and fire support platform. The Raven Prime, even more so than other Ravens, has little going for it in terms of firepower. Two Medium Beam Lasers and a single Streak Short Range Missile Six-Pack comprise its entire compliment of weapons - where the Prime variant really shines is in reconnaissance. The Prime also has Bloodhound Probe as well as MASC and GECM, making it a very capable and stealthy scout mech. Note that the Prime has only one additional Heatsink which severely limits liberal use of its MASC while firing its weapons. When in combat, Mechwarriors are advised to use MASC sparingly as the Prime will overheat quickly. Instead, Mechwarriors can surge their MASC while in combat (holding down on the MASC button, then releasing after a second or so). Surging causes the Mech's speed to become highly unpredictable and can often cause enemies to miss their target. Unlike other, slower Ravens, the Prime has an improved NARC beacon launcher, allowing it to move in, mark a target, and leave - which in turn allows allied missiles to eliminate the target from afar. The Prime has only one spare ton available for ammo, so care must be taken when choosing targets to mark with the iNARC. Any kind of NARC is an ammo-hungry weapons system, so Mechwarriors that are either poor at aiming NARCs or plan on painting many targets should reserve their free ton for NARC ammo. On the other hand, Mechwarriors with better accuracy or plan on painting very few targets are advised to get an extra ton of SSRM ammo. Both the NARC launcher and the SSRM6 will chew through their ammo quickly. SSRMs don't have a very long lock-on time, but the Prime can bypass even this by NARCing their target, the SSRMs will follow the NARC as long as the SSRMs are fired in the general direction of the NARCed target. Like most other Raven variants, the Prime also carries C3 equipment, which rounds out its electronics package and allows the mech to share radar and contact information with allied assets. Lastly, like most Raven variants, the Prime incorporates EOptics, which - in the case of the Prime variant - can allow the pilot to effectively snipe with the iNARC. The A is a beefier version of the Prime. Instead of using a NARC, the A uses a TAG laser, which requires slightly more skill than a NARC, and constant visual contact, but consumes no ammo. In addition, the A replaces the SSRM6 and MBLs with a pair of Large Pulse Lasers. This change in weaponry frees up enough tonnage to carry three Double Heat Sinks. The additional cooling capacity allows the A to use its MASC much more frequently than the Prime, effectively giving it the highest sustainable speed of any Raven variant. Like many other variants, the A carries Bloodhound Probe, C3 and GECM, as well as EOptics, to fulfill its role as a scouting or direct fire support platform. The B variant dramatically changes the Raven's role, packing different gear and weapons to turn this scout into a support-brawler. 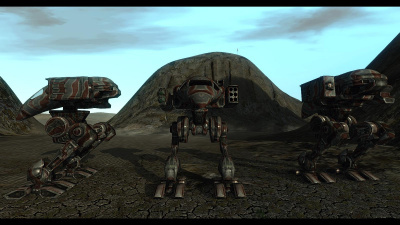 The signature GECM is still in place, however it is now complimented by a single Laser Anti Missile System,Beagle Active Probe making the B a less capable scout mech compared to the Prime, but an excellent choice as a support asset that stays close to its allies thanks to its 7t of armor, making it one of 2 most armored Ravens. It still carries C3 to relay its radar information to allies. Weapons-wise the B variant takes on a more hard-hitting loadout; three Small Pulse Lasers and one Lubalin Ballistics-X AC10. The LBX10 offers some limited Anti-Air capabilites, but is best used in ground-based operations, supporting allies and exploiting holes in enemy armor. Due to this variant's focus on short- and medium-range firepower,it lacks MASC, therefore pilots must be wary of their surroundings and avoid being left behind should their team be forced to retreat or fall back. The Raven C can fill the role of scout like most other Ravens, but where most Ravens have short- to medium-range weapons, the C packs one Extended Range Particle Projector Cannon, allowing it to snipe targets as far away as 900m. It is usually difficult to determine where PPC sniper fire is coming from, so the C can often fire many shots while remaining relatively unnoticed. The inclusion of GECM further decreases this variant's noticeability, while MASC allows it to quickly fade behind cover after each shot, should cover be necessary. Further augmenting the C's sniping capabilities is a BHP - giving it a massive 1400m radar range - as well as EOptics. For close-range backup, the C also sports two ERMBLs. Mechwarriors should be aware that the C has only three DHS's, and firing all weapons constantly will quickly overheat it, even if its MASC is rarely engaged, making the C a poor choice in a brawl. As with all other Ravens, the C is equipped with C3 to share radar information with its comrades. The Raven D sits comfortably as a jack of all trades variant. It can forefill the role of a scout with its generous electronics equipment BHP, C3, GECM, and EOptics. Its Extended Range Large Laser and three Extended Range Medium Lasers gives it longer range direct fire weapons than the Prime variant and is not ammo dependent. It also mounts a NARC launcher, albeit the standard shorter range version, so Mechwarriors deploying it would have to close within 460m of their targets. As the D only carries 2 DHS's, Mechwarriors are encouraged to chain fire the ERMBLs on the D for this reason. Finally, most of this variant's firepower is contained within the three ERMBLs in its left arm, therefore Mechwarriors are advised to ensure that arm's survival. The Echo was the most common Raven variant in MWLL 0.4.x mostly due to its formerly low price. It's surprisingly adept at dealing heavy, sustained damage, even late-game. The E variant has GECM, C3, a pair of Medium Pulse Lasers, and a single heavy-hitting Medium Range Missile 20-Pack with 1 Free ton of ammo to feed it. The MPL's fast fire rate, incredibly easy fire control, combined with the Raven's 360° degree torso rotation, make this variant at least somewhat decent against fast targets. One Flamer is attached for those close encounters. 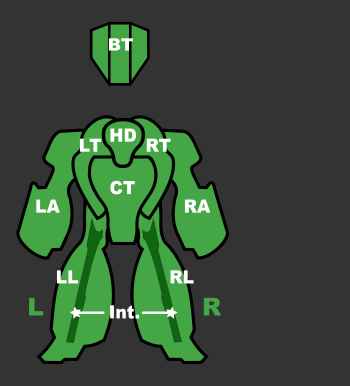 Where the E really excels is against slow moving, large targets like tanks, heavy mechs, and assault mechs. The E is the secont most armored, but is still a scout mech, and as such should not engage alone. Additionally, all of its weapons are mounted in its arms, so pilots should take care to protect them. Packing 2 Autocannon Class 2s to back up an Extended Long Range Missile 15-Pack give the Raven F a very long reach. With a TAG laser, the Raven F can quietly paint a target to shower from up to 1300m away. Like most Ravens, the F carries both a BHP, C3 and GECM, enabling it to take full advantage of the extended-range LRMs it carries. However, the AC2s are not highly accurate against moving targets at long range, nor do they deal much damage. The Raven F also has no energy weapons, making resupply a high priority despite having 2 free tons for extra ammo. Its armament is also entirely arm-based, so protecting both arms is a priority. A departure from other Ravens, the G variant mounts a brawling Rotary AC5 with 1 extra ton of ammo and 3 Small X-Pulse Lasers plus 2 DHS to support it's firepower, the former of which allows it to wreak havoc into any target in range and SXPL to close the times the auto-canon cools down or unlocks from a jam. An Angel ECM takes the place of the standard GECM, sacrificing personal cover to instead provide ECM coverage for nearby allies along with LAMS for some missile protection. All the time providing radar info with its C3 suite. 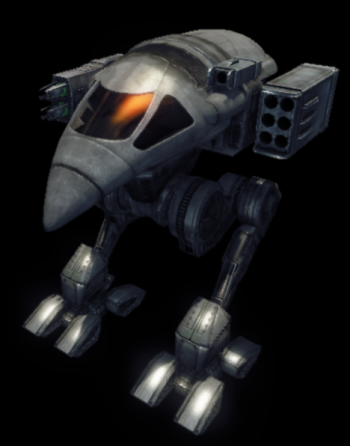 This turns the Raven G into a highly-effective fire support Mech capable of laying down suppression fire during the early game. BAP is included for increased radar range revealing enemy locations at distance. Although it is one of the cheaper Ravens, it cannot be purchased at the start of the game without donations from other members of the team. Care must be taken not to jam the RAC, as much of the G's utility depends on it. Even more care must be taken to keep both arms, as they house this variant's only means of defense. The right mech for the warlord in the early game - rely info from the BAP radar, deny enemy NARCs for nearby units, finish off tougher targets in the kill zone and lead your units into epic pushes and brawls. The Raven was designed by the Capellan Confederation and saw its first taste of combat when it was rushed into production during the Fourth Succession War. During that conflict, it won praise from commanders on both sides, and many wrecks were salvaged by Davion technical crews and brought home for reverse-engineering. With the addition of previously lost Star League-era technologies in the 3030s and 3040s, by the time of the Clan Invasion in 3050, the Raven was one of the best dedicated scouting platforms the Inner Sphere had to offer. This page was last edited on 18 February 2019, at 20:50.